I may have said I wanted to sew more clothes this year, but there's been hardly any evidence of it on here. It's not that I've been slacking off though - my machine has been working hard, but it's mostly been working on clothes for sale now that I've started back at the Tea Rooms again. But here, finally, is something I can show! I knew what I wanted to make with this unknown (polyester?) 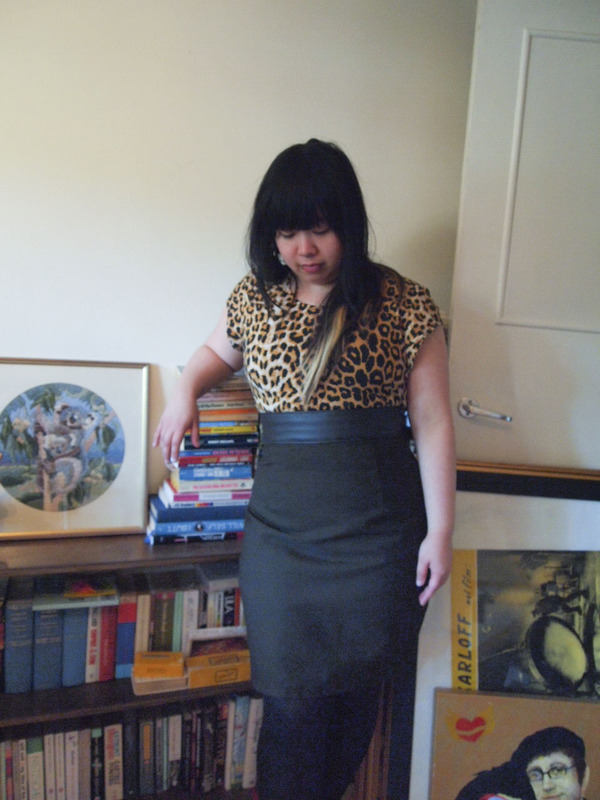 suiting fabric as soon as I found it in the op-shop - it would be perfect for a pencil skirt! At only 50p for about 2 metres, it didn't matter too much if I screwed it up. The pattern is self-drafted, based on a few skirts I had, and plenty of Google images for research. It turned out to be fairly simple, although the first version came out a bit too wide at the hem. I fixed that by tapering it a couple of inches from the hips, so to give it that snug, fitted look. And snug it was too - I'd just finished lunch before the photoshoot, and had to get the Manbacon to close me up. The faux-leather for the waistband came from a friend's fabric stash - we're currently working on handpainted cushions, and are using the fake leather for the backs of some of them. I 'borrowed' a long, narrow strip for the front. 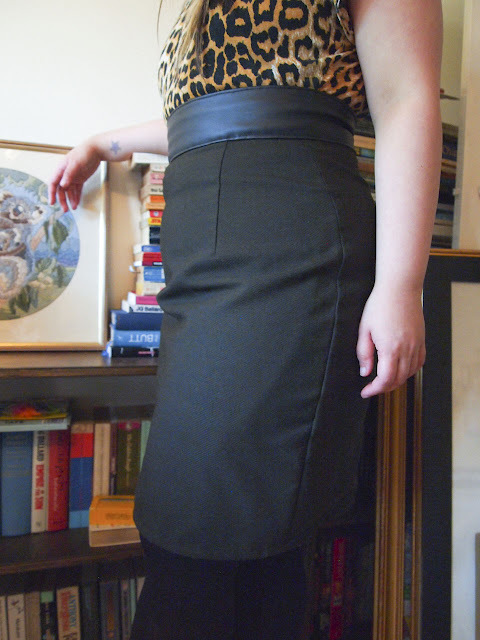 The back of the waistband was made up in the same fabric as the rest of the skirt. Of course, as soon as I got it all finished and photographed, the weather became much too warm for me to wear a fully lined, thick polyester skirt, and all I want to do these days is to swan around in floaty summer skirts.